Hello guys ! you are reading about. Today we’ll show you two best whatsapp trick that can really help you a lot. And that trick is How To Save Your Mobile Data From Auto Media Downloading. When media files download automatically we have lost our mobile data. By default, WhatsApp will automatically download images over your cellular connection to provide you with quick access to your latest photos. This feature may very costly for you. By this trick you can stop auto download media files. Whatsapp is the most popular messaging app of the world with over 600 million active users. It has many feature that can really help you. But sometimes it may effect you by economically. Suppose your sim operator data is so expensive. Whatsapp has a option that can lost your expensive data. That option is auto download media files. Yes this option can harm you. But Whatsapp give us the chance that we can stop that option. And of course you can save your data from lost. So, let’s know how you can stop auto download. Here your trick bellow. Simply go to Whatsapp MENU. Now go to Data Usage. 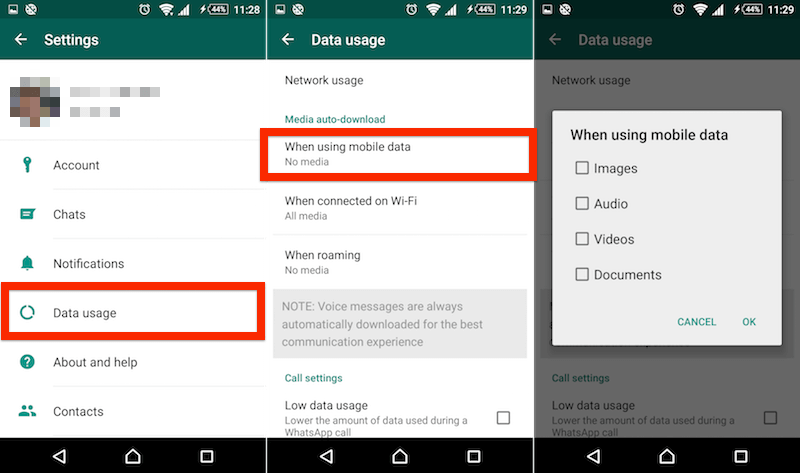 Uncheck all when using mobile data. You can auto download your media files by not changing when using wifi. When you are in wifi your media files will auto download. And that’s way you can save your mobile data. Media files are so important to all of us. Automatically downloaded media will show up in your gallery. If your are a I-phone user then don’t worry. You can stop it more easily then other users. It can help you so much. It can also save your file storage. When you download some media file its go to your storage and when you stop it your storage will free from these. Now let’s know how you can stop it on your I-phone. You can see Save incoming media . You can do lot’s of thing on whatsapp. If you want to know about top trick on whatsapp and other social media then simply click here. We hope you like this trick and enjoyed so much. Connected with us to get more and more new and awesome tricks. Till then be well.